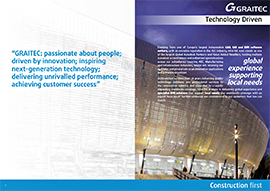 The GRAITEC Italy team is pleased to announce that they will be participating in the SAIE EXPO exhibition in Bologna, on 22–25 October 2014. The SAIE EXPO is an opportunity for professionals to meet the major international and national software houses, as well as producer and service companies, and to understand and acquire the tools currently driving an unprecedented growth in design methods. Graitec will be presenting its new solution, GRAITEC will be participating in the SAIE 2014 exhibition, a management tool for carpentry production companies. Moreover, GRAITEC will be presenting Advance Steel 2015, the solution for structural detailing and fabrication, and Advance Design 2015, a superior solution for the structural analysis and design of reinforced concrete, steel and timber structures. This event will also be an opportunity to follow a number of free product presentations organized by the GRAITEC Italy team. Come see us, to be part of the GRAITEC BIM Revolution.